This Custom Cedar Log Home is a charming, new, custom built home, designed with the traveler in mind. It is conveniently located near Yosemite National Park along scenic Highway 49 in Historic Mariposa, approximately 9 miles east of the town of Mariposa. Beautifully decorated and exceptionally clean, the log home has three bedrooms that sleep six - all with brand new mattresses/box springs, and solid wood flooring. The Master bedroom features a king-size, solid oak bed and new 36 inch flat screen TV. The Master bathroom is wheelchair accessible featuring elegant whirlpool tub. The other two bedrooms are also tastefully decorated in a rustic theme; one with bunk beds, one with a Internet computer and WiFi wireless connection and full-size Futon bed. The large, open family kitchen has built-in new Jennaire dual bbq cook top and new appliances throughout, granite counter tops and custom cabinetry. It is fully equipped for the gourmet cook and includes all the conveniences for vacation entertaining. The highlight of the Living room is a wood burning free-standing stove for cozy evenings. All Living room furnishings is new leather, including an entertainment center with 50” flat screen satellite TV, stereo sound and home theater system, FM/DVD/CD player. Enjoy our new Wii entertainment system. The fully furnished dining room next to the living room affords easy access to the kitchen. Outside amenities include a gas barbecue, and wheel chair accessible ramps. Decks are ideal for outdoor dining, relaxing and star gazing under incredible open night skies, away from city lights. There is also a covered porch with log furniture, a glider log swing and fishing pond. Children under 16 must be supervised by an adult. 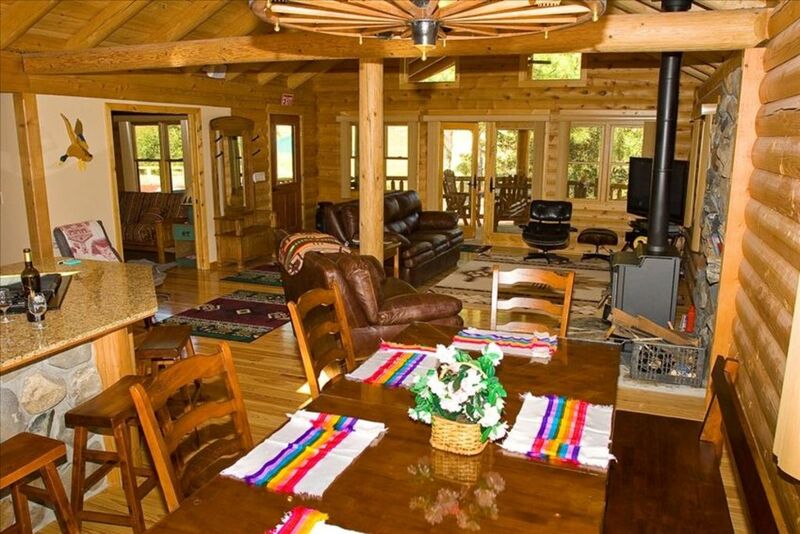 The Cedar Log Home is just the place for families and friends looking for comfort, convenience and charm. The open floor plan is ideal for socializing and relaxing. Located on 5 acres of beautiful Mariposa country side. Leave the crowds, traffic and noise behind. The new Cedar Log Home is your ideal vacation home. The new Cedar Log Home is conveniently located near Yosemite National Park, the quaint old gold mining town of Mariposa and offers a variety of activities for all seasons. There is easy access to two nearby park entrances; Arch Rock Entrance Station along the wild and scenic Merced River Canyon on Highway 140, or the South Entrance Station along Highway 41 on the way to the majestic Giant Sequoias. Nearby is the historic gold mining town of Mariposa where visitors enjoy the California State Mineral Museum, Mariposa History Museum as well as quaint shops, excellent restaurants and wine-tasting from local vineyards. Close to Yosemite National Park and many other attractions. A log cabin from a Disney movie!! The cabin was amazing and exceeded our expectations! The amenities were great! Great location close to both Yosemite and Bass Lake. We loved the little town of Mariposa!! Charming place!! Cozy cabin with every amenity. Beds are super comfy. Great place to stay if wanting to explore Yosemite. Very nicely furnished, cozy log cabin near Yosemite National Park. Perfect for a family of up to 5 people. A little bit removed from both Mariposa and Oakhurst, being situated somewhere in the middle. Takes about 12 minutes to get to Mariposa and close to 20 to get to Oakhurst. But overall a very nice place to chill out after spending a day or two exploring Yosemite. Perfect home base for Yosemite! Perfect cabin for Yosemite! Beautiful drive into the park daily. Loved that there were small amounts of amenities at our disposal. Lovely grocery store conveniently located in Mariposa. We cooked in most nights and found everything we needed to do so. We loved the wood burning fireplace. Enjoyed watching the rabbits, ground squirrels and quail on the grounds. WiFi worked great and we watched Netflix most nights. We have ATT and had no signal but connected over WiFi for calls and texts with no problems. Ate in town one night at 1850. The food was ok, not great and a little pricey. We hired a private guide from Yosemite Up Close. Ira made our visit very personal. We did that the first day so knew what we wanted to come back and explore the rest of the week. I highly recommend them. Thanks for sharing your beautiful cabin with our family! Excellent location (about an hour from one of the entrances to Yosemite). Friendly hosts. Everything we could have asked for. Great log cabin with good amenties. Easy drive to Yosemite. Wonderful stay overall.